The fruit trees are blooming oh so nicely. The koi pond is very active with spawning fish and leaping frogs. The pond plants are waking up and the sound of the waterfall flowing is pure bliss. 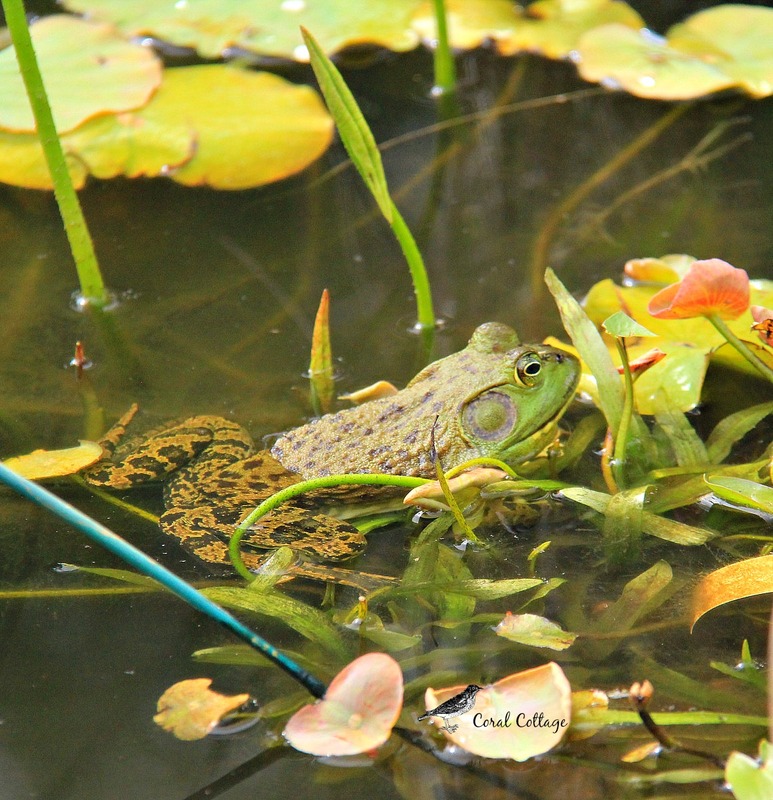 I lay awake at night with my window open listening to the bullfrogs singing. Oh how I love spring. The trees are full with the song from oh so many birds. I filled this suet basket with scraps of yarn from Mother Cottage’s stash. 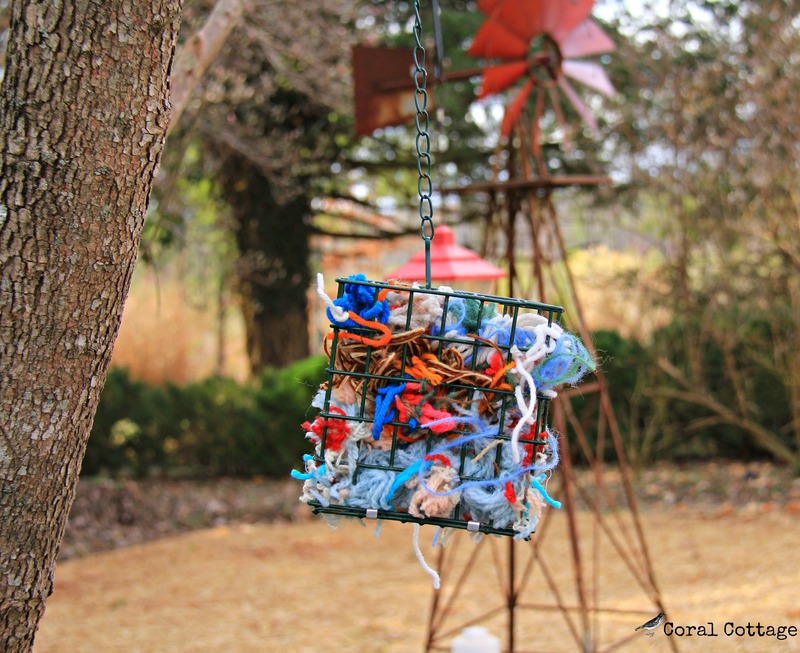 It makes my heart happy to think of birds using her yarn to weave their nests throughout our property. 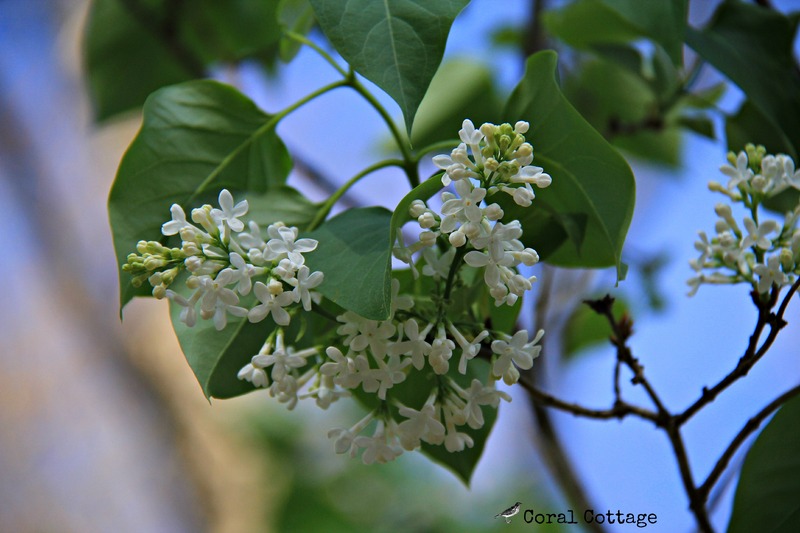 The lilacs are in full bloom and the cottage gardens are heavy with their scent. The young chicks are now free ranging during the day. We haven’t named them yet, except for the big guy, which we know is a Rooster, his name is Stanley. Lucy and Ethyl are still not happy about them being here. We got a new hen-house so Lucy and Ethyl could have their own space. It is quite cute, but I don’t think they are impressed with it. Boo and Peanut (Precious in her former life) are adjusting well to their new life here at the cottage. Mr. Cottage says we did good adopting them. 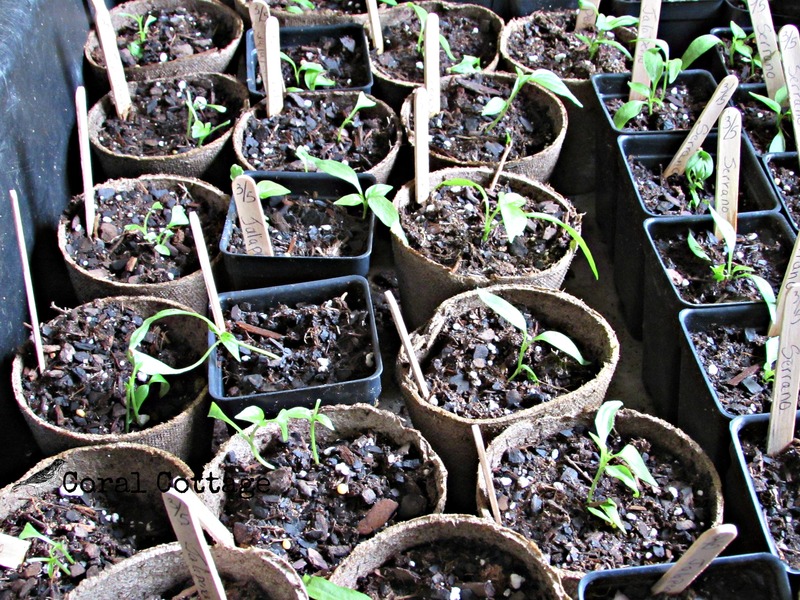 Back in March I planted seeds for spinach, carrots, radish, and what seems now; a zillion peppers. 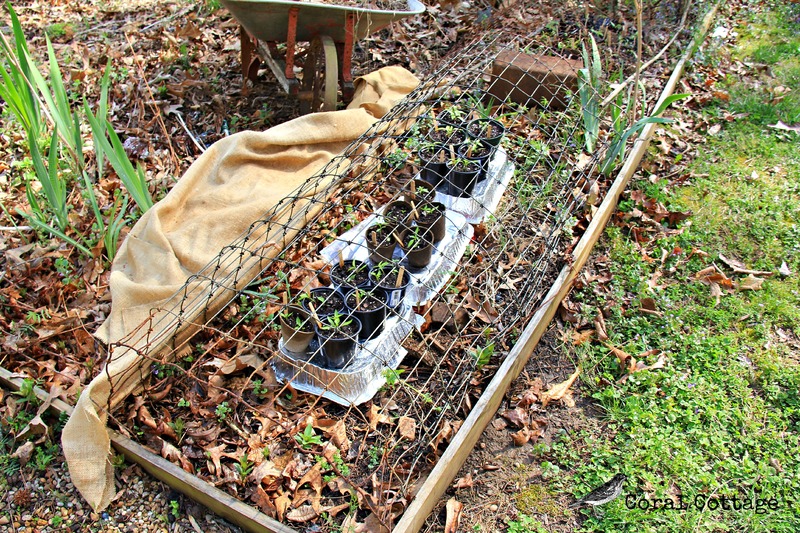 I made a wire cage to go over the seedlings, to keep the chickens out and so that I can drape burlap across them for protection. 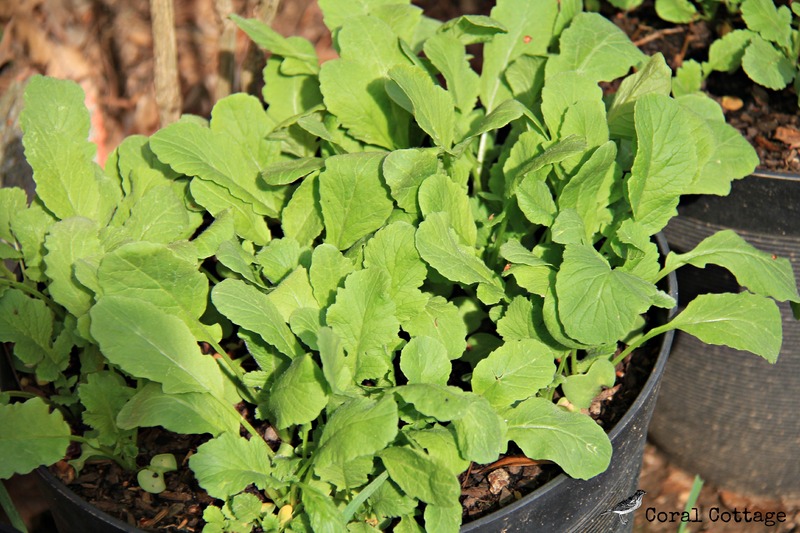 Who is going to plant all these in the garden when the time comes? As a last hoorah this weekend, I planted 28 Dahlia bulbs, 32 Ranunculus, 4 Eryngium, 3 Echinacea and I threw in a few sunflower seeds for good measure. Boo and Peanut, helped. 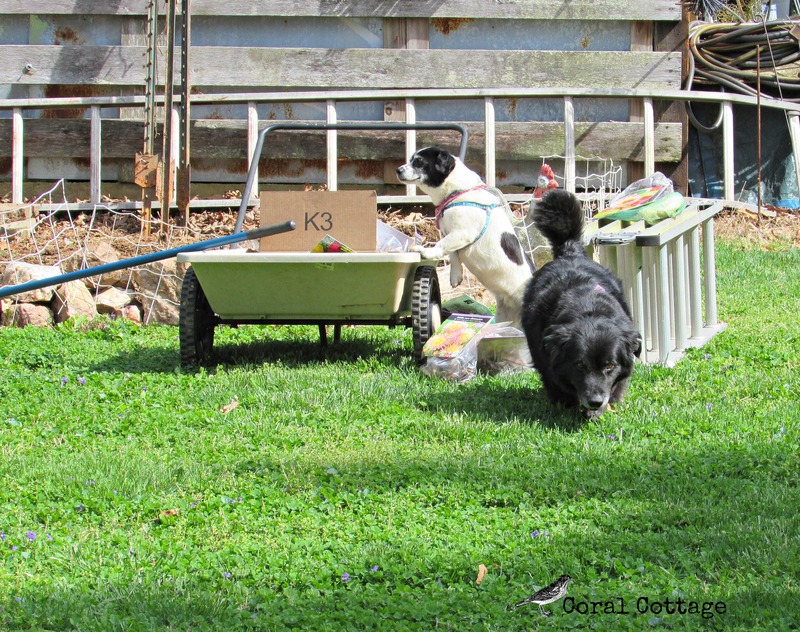 Well mostly Peanut got in the garden cart and sat on top of the flower bulbs, Boo just wanted attention. Mr. Cottage is going in to the hospital on Tuesday for Lithotripsy, sadly he has a rather large kidney stone. Ouch. He has been pretty miserable for some time, so it will be a relief to get this over, but not much fun. Y’all keep him in your good thoughts, won’t you? I’m heading in to surgery on Friday. I’d like to have a great story to tell about how I was skydiving, or maybe mountain climbing or on safari in some far region fighting off wild creatures and got hurt in the process. The sad truth is that I tripped over one of my cats and fell down the stairs as I was heading out the door to hang laundry on the clothes line. I sailed through the air, did a somersault and landed on my shoulder. My first thought was, thank god I’m home alone and nobody saw me do that. My second thought was, oh crap I’m home alone and nobody is here to help me get up. My third thought was double crap, I’m going to have to wash this laundry again. I’ve blown out my shoulder so the surgeon is gonna fix it for me. Hopefully, Mr. Cottage and I will be back to our old selves before long, enjoying the good life with all the furry, feathered and finned babies and sharing their antics with you guys. Y’all be well, until we visit again. 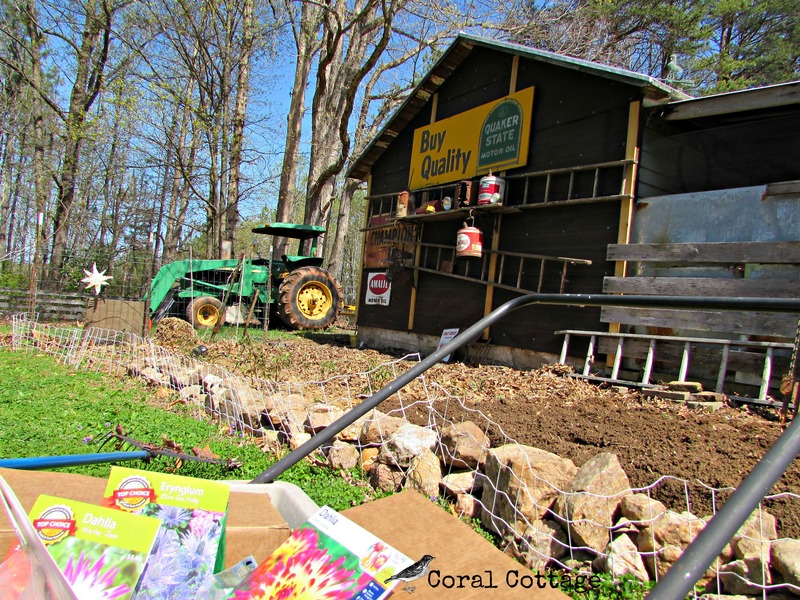 Kim of Red Dirt Farm • This entry was posted in chickens, Country living, Gardening, Uncategorized and tagged cats, chicken keeping, coral cottage, cottage living, dogs, fluvanna, gardening, hobby farm, homesteading, kidney stones, planting seeds, shoulder surgery, SLAP band tear, spring, torn rotator cuff, virginia. Bookmark the permalink. Oh my, I sure enjoyed your spring pics. Love the scrap basket for the nesting birds. I use a shedding blade on Abby and throw the shovel full of hair out into the yard for the birds. All the nests on our property are lined with horse hair. Wishing you and your mister all the best for speedy recoveries. I’ll be thinking of you. Please keep us posted on your progress when you can. 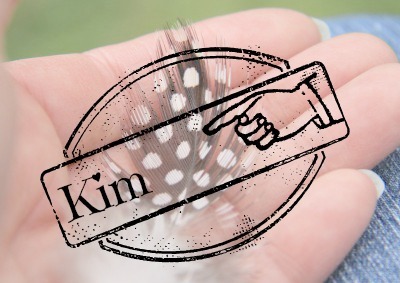 Kim, I love the idea of leaving out Mother Cottage’s scraps for the birds to use in their nests! Best wishes for smooth surgeries and smooth recoveries for both you and your husband! I’m sending up prayers for successful surgeries. I’m praying for both of you. I will miss you! Kim, the spring garden is looking wonderful. 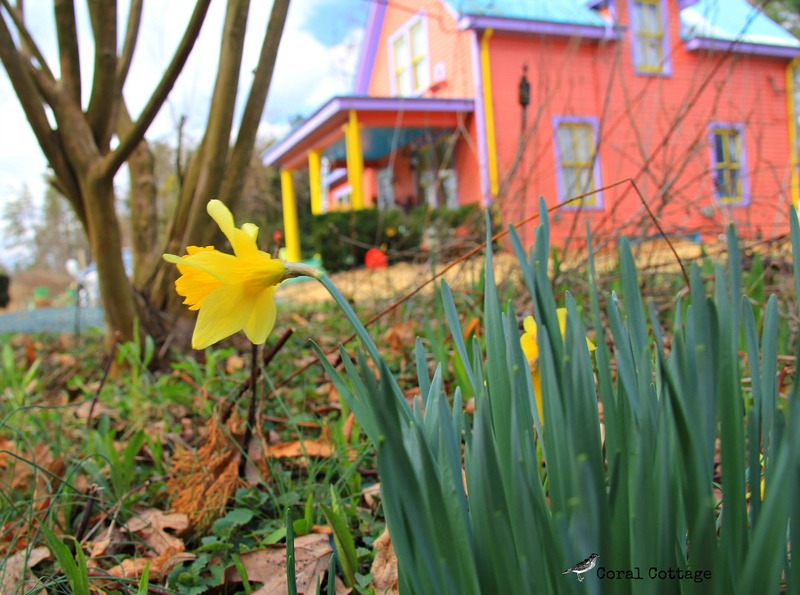 Glad to see the snow gone and things coming to life. Boo and Peanut look like they are fitting in nicely. I’m sure they are thrilled to be living at the cottage now. Best wishes to you and Mr. Cottage! I hate to think of the two of you in pain. Heal quickly, my friend!